Saturday Morning Cult-TV Blogging: Secrets of Isis: "Bigfoot"
On a school field trip to the forest, Mrs. Thomas (Joanna Cameron) is shocked when students Cindy Lee (Joanna Pang) and Lee (Scott Columby) think they have caught sight of Bigfoot, the mythical Sasquatch. 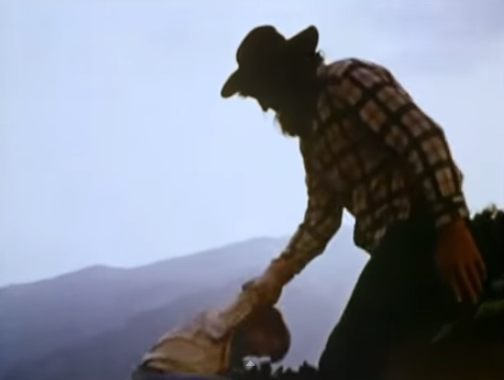 Lee decides to stay in the woods and attempt to catch a photo of the legendary beast, but encounters instead a giant stranger named Richard (Bill Engresser). 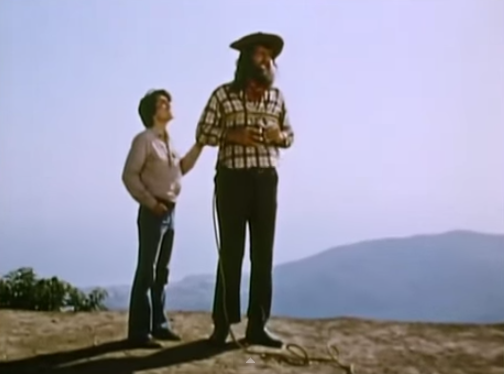 When Lee loses his footing and nearly falls off a mountain, the strange, silent Richard comes to his rescue and is revealed to be a gentle giant. 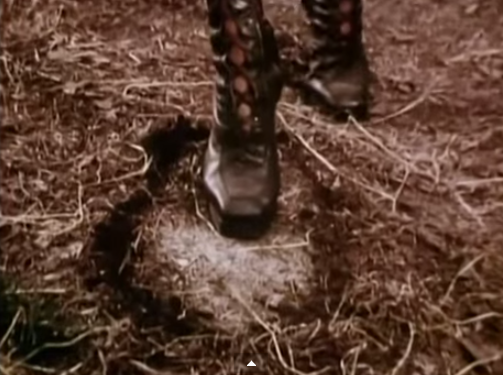 “Bigfoot” was all the rage in the 1970s pop culture, so it was only a matter of time, perhaps, before The Secrets of Isis (1975 – 1976) tackled the subject too. As is the case with the series’ installment about UFOs (“The Lights of Mystery Mountain,”) the paranormal subject matter is ultimately debunked. Isis sees over-sized footprints in the dirt at one point, but they belong to a reclusive, gentle human being of unusual size…named Richard. The problem is, after you see Richard, you realize that he could not have made those footprints. He's tall, but not THAT tall. Although it is rewarding that Secrets of Isis preaches tolerance and acceptance for those who are different, imagine for a second the extreme disappointment of a child watching this episode, anticipating an appearance by Bigfoot and getting, instead, a colossal bearded recluse. 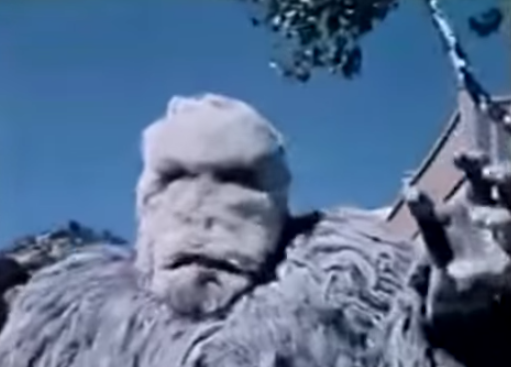 Saturday Morning Cult-TV Blogging: Bigfoot and Wildboy (1976 - 1979): "The Abominable Snowman"
The production team of Sid and Marty Krofft, and creators Joe Ruby and Ken Spears bring us our next Saturday morning series here on the blog: Bigfoot and Wildboy (1976 – 1979). This unusual series aired on ABC, first as part of the 90-minute The Krofft Supershow and then in its own time slot for a season in 1979. Originally, The Krofft Supershow was a kind of compendium or anthology of series. Each week, Captain Kool (Michael Lembeck) and the Kongs would introduce episodes of Dr. Shrinker, Electra-Woman and Dyna-Girl and Wonderbug. In the second season, Dr. Shrinker was dropped in favor of Magic Mongo and Electra-Woman and Dyna-Girl was traded for Bigfoot and Wildboy. 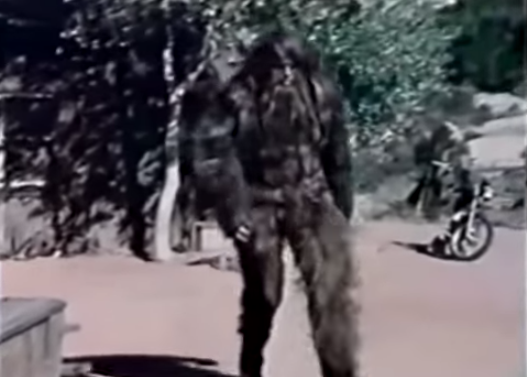 As I’ve written here and in other venues, Bigfoot was a major “thing” in the 1970s, explored in documentaries, and imagined on such series as The Six Million Dollar Man (1973 – 1978) and The Bionic Woman (1976 – 1978). So, a Saturday morning series about Sasquatch must have seemed like a slam dunk. In Bigfoot and Wildboy, Ray Butcher stars as Bigfoot, an intelligent (if hairy…) creature who, eight years before the start of the series, befriends a child and raises him in the forests of the Pacific Northwest. This child becomes Wildboy, Bigfoot's sidekick and friend. 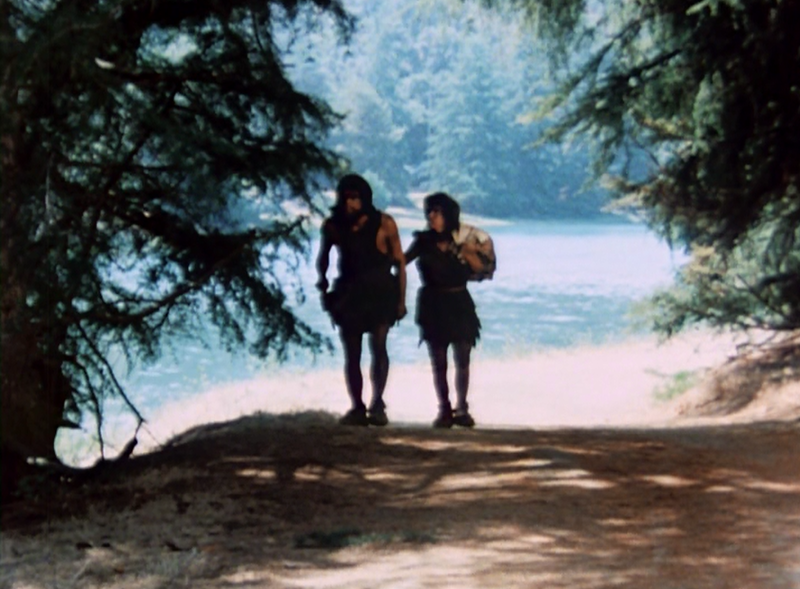 In the first year of the series, Wildboy is often accompanied by a Native American girl, Susie (Monika Ramirez), on their adventures. It is plain from a screening of a few episodes that The Six Million Dollar Man’s Bigfoot is a significant and important inspiration for this series. 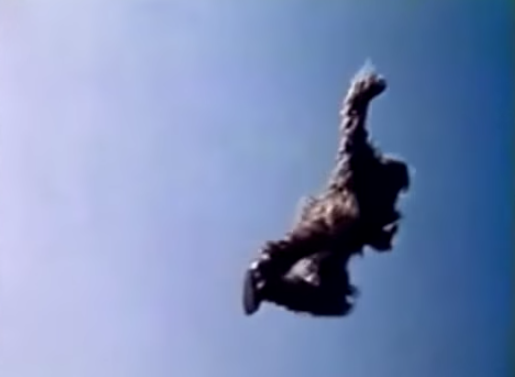 We see several shots, for example, in each episode, of Bigfoot running and jumping in slow-motion, to strange “whooshing” sounds. In fact, “The Abominable Snowman,” an episode aired in two fifteen minute parts, features a lot of filler, and that filler consists of Bigfoot running through the countryside, and jumping. The special effects look impressive in a seventies kind of way, in the same way as the effects do on the aforementioned bionic series. But too much of anything -- even Bigfoot running and jumping -- gets old quick. These scenes are repetitive and sort of dull, today. In “The Abominable Snowman,” an evil scientist, Dr. Porthos (David Hurst), plans to intercept an important U.S. weather satellite from his base in a ghost town in the Pacific Northwest. He deploys his robotic Abominable Snowman to keep strangers at bay. 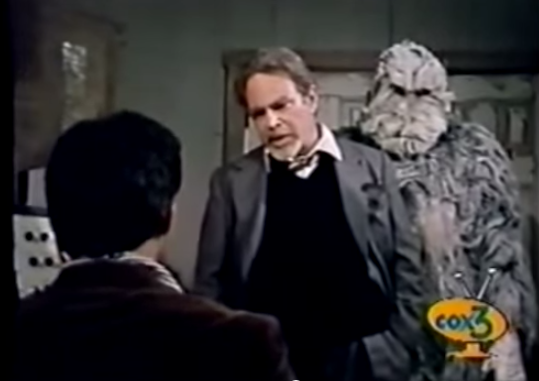 A young man named Toby (Christopher Braun) returns to the town to visit his father, but is accosted by the Yeti robot. Before long, Wild-Boy, Bigfoot and Susie come to his aid, and attempt to stop the robot, and prevent Dr. Porthos from interfering in the launch. During the course of the episode, Bigfoot gets locked in a vault, but fights his way out, and ultimately saves the weather rocket/satellite. He also defeats the shaggy-looking Abominable Snowbot. This isn’t a Filmation series, so Bigfoot and Wildboy goes light -- at least here -- on the preachy moralizing. Instead, this is a straight-up adventure show, with an unusual set of superheroes. It’s a little strange watching the first episode because nobody considers it strange to see Bigfoot for the first time. Instead, characters just accept that he’s there, and committed to helping out. I’d have to stop and think for a minute. Wow, Bigfoot is real. And he can talk. And he can raise human children…. The writing is pretty shallow here, truth be told, and Dr. Porthos boasts no real motive for wanting to control the government’s new weather satellite. Also, it isn’t clear why he would not build a Bigfoot robot, rather than a Yeti-bot, given the part of the world where his HQ is located. In short, “Abominable Snowman” -- and indeed Bigfoot and Wildboy itself -- helps to explain why the seventies were so weird. How do you explain a show like this today? A leaping, racing (in slow mo) Sasquatch and his teenage ward fight criminals in the Pacific Northwest, and nobody thinks that’s weird? Yup, it was the seventies all right. I loved growing up there. I can't believe this news is true. But The New York Time is now reporting the death of Leonard Nimoy, the talented actor who played Mr. Spock in the original Star Trek. It is impossible for me -- in this moment of disbelief and sadness -- to report fully or in any sense cogently about what Mr. Nimoy meant to my life, or to Star Trek fans, or to science fiction in general. In his many performances as the half-Vulcan Spock, Mr. Nimoy showed audiences how they could love, appreciate, and respect someone who holds different beliefs than they do. Spock had pointed ears, pointed eye-brows, green blood and no emotions, but he was, nonetheless, the dearest of friends. And playing a (noble) alien, Mr. Nimoy's Spock showed us also what it means to be human. Spock exposed the contradictions of humanity in a way that was not threatening to hear, or to see. He could make us see ourselves in ways we couldn't, or didn't want to. And again, we loved him for it. In his alien eyes, we recognized ourselves. One might think that Spock was an easy or simple role to play...simply cut yourself off from your emotions, right? Be stoic! But Leonard Nimoy persistently brought dignity, humor, intelligence, and sensitivity to the role. He could masterfully express how deeply Spock "cares" about his friends, or his parents, or his belief system without demonstrating anger or any other overt emotion. In short, Mr. Nimoy took a character that could have been wooden or two-dimensional and transformed him into a magical, beloved icon of American pop culture. 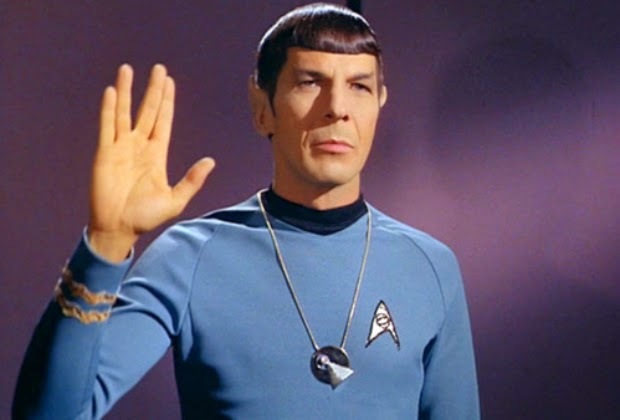 But Spock is the character with whom Mr. Nimoy will forever be associated. He made that character his own, and offered the world a cool, intellectual, reasoned voice just when it was needed most -- at the height of the Civil Rights Movement, the Vietnam War, and other frissons of the late 1960s. I don't think I can bear to say much else at this particular moment. Not because Leonard Nimoy's life was unimportant, but because for so many of us, it was incredibly important. Like so many of you, I grew up with Nimoy's Spock -- the lonely outsider who found a home on the starship Enterprise -- and so to lose Mr. Nimoy is a terrible thing. We all knew the day was coming. And it is not logical to be taken by surprise by mortality, Spock might remind us at this juncture. And yet still, Leonard Nimoy's passing is devastating. At Flashbak: Here’s the Story: The Brady Kids Do Horror and Sci-Fi! My latest piece at Flashbak looks at the post-Brady Bunch sci-fi/horror TV career of the Brady Kids. It's a list that includes Isis, Bigfoot and Wildboy, A Vacation in Hell and...Megapiranha. 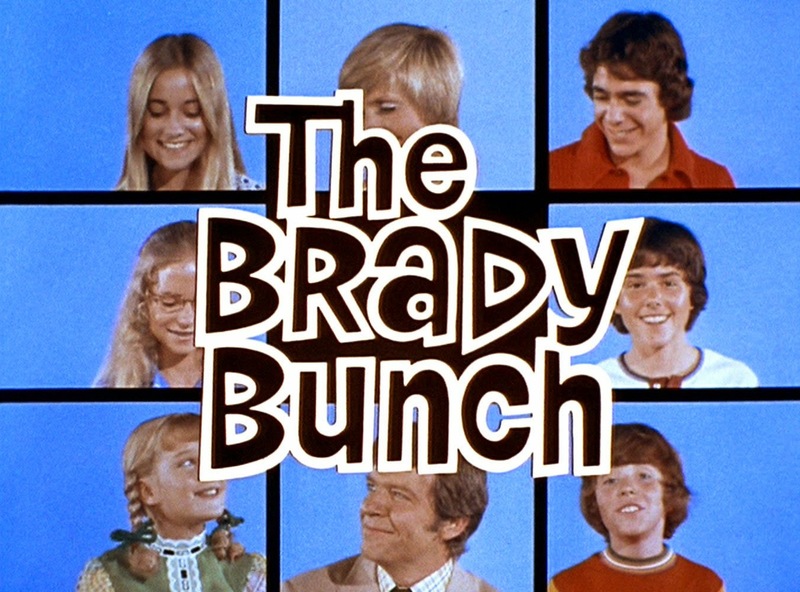 "After the cancellation of The Brady Bunch (1969 – 1973), the actors who played the Brady kids got their own (short-lived) variety show, and at least two additional prime time spin offs: 1981’s The Brady Brides and 1990’s The Bradys. But between such gigs, the actors (all except Susan Olsen -- Cindy) turned to guest appearances on science fiction and horror television, some on Saturday mornings, and some in prime-time. Here’s a look back at the highlights..." (cont. at Flashbak). Given the nature of Hollywood product in 2015, many of my efforts in daily film criticism here involve the assessment of sequels, remakes, prequels and even re-imaginations. 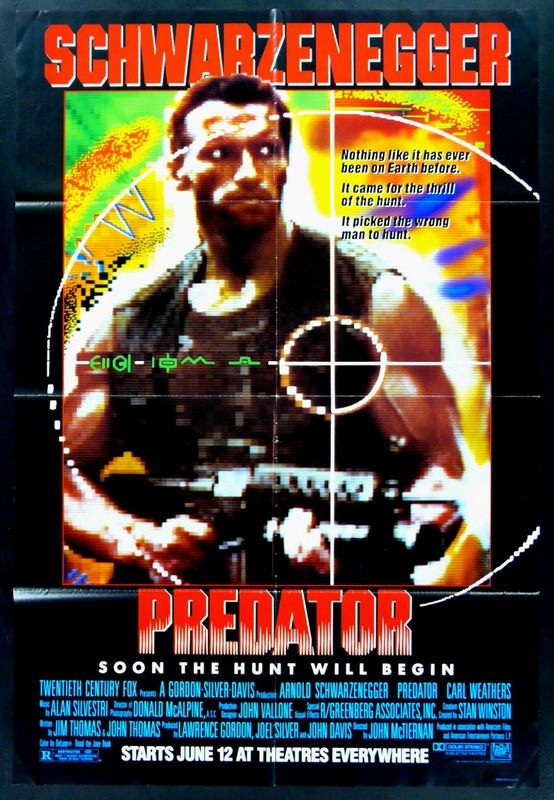 Back in 1987, the conventional wisdom about John McTiernan’s Predator (1987) was that it started out like Rambo: First Blood Part II (1985) and ended up like Alien (1979) or, perhaps, James Cameron’s Aliens (1986). And that, the critics declared, passed for originality in Hollywood. This action occurs in the first act, and establishes, per the dialogue that Schwarzenegger’s team is “the best.” We see that adjective vividly demonstrated in a siege set-piece of extreme violence and bloodshed. The soldiers who were the predators are now the prey. So where many 1987 critics choose to see a film that is half Rambo and half Alien, I see a film that develops logically and consistently act to act. You can’t get to that final, almost primordial reckoning in the jungle between the Predator and Dutch unless you frame the debate in precisely the way the screenplay does, and in the way McTiernan does. 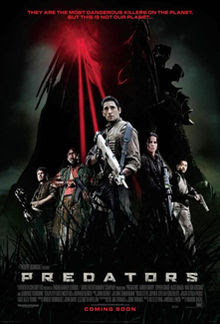 Well, in a sense, Predator might be read as a subversive response to the militarization of action films in the mid-1980s, and the kind of shallow, rah-rah patriotism that gave rise to efforts like Heartbreak Ridge (1986), which celebrated an American military victory over…Grenada. 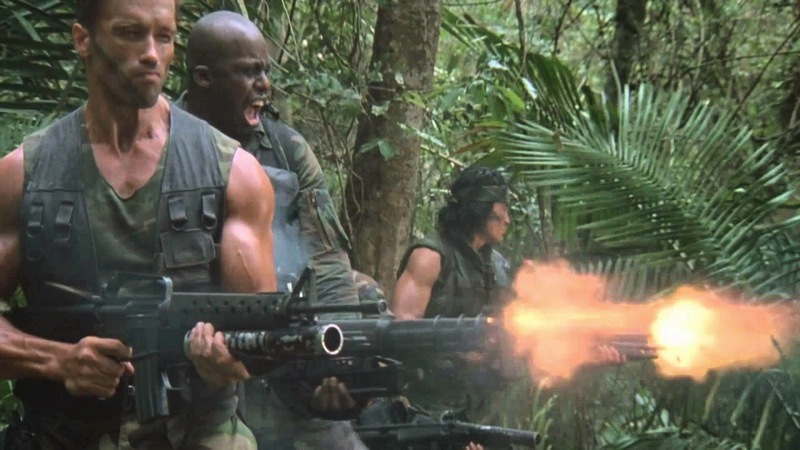 Predator features a lot of macho talk and clichés about war (“I ain’t got time to bleed,”) but it succeeds because it cuts right through this surface, hackneyed vision of military might and suggests a different truth underneath. 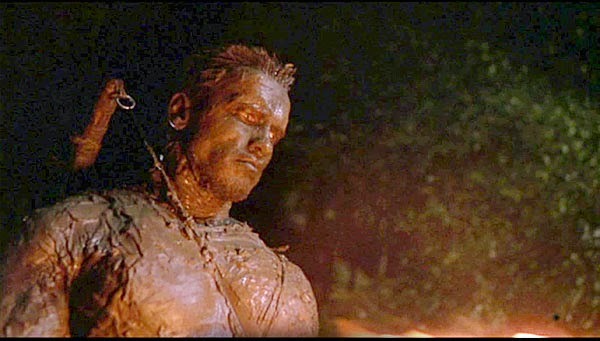 This movement, this force, is then balanced by McTiernan against the still-ness of the Predator’s vision or perspective. A contrast is quickly developed and then sustained. 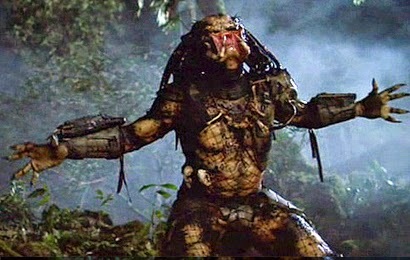 Throughout the film, we see through the Predator’s eyes, or in Predator-vision. These shots, from high above the landscape (in the tree-tops) tend to be still, un-moving. They thereby capture a sense of the whole world unfolding before the Predator, a complete panorama or landscape. The Predator, quite simply, is able to see more of the world, and see it better. He is able to strike from the tree tops with his shoulder-mounted laser cannon, and target with laser sighting his distant foes. 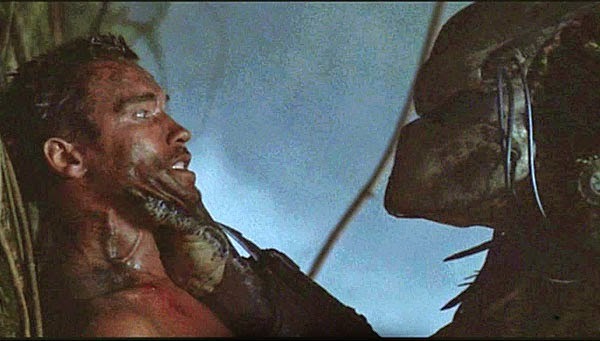 Those who don’t appreciate Predator tend to watch the film, listen to the macho tough talk, and consider the film a kind of stupid, macho action/horror movie. Then he is able to trick them using their own words. Their mode of expression becomes a tool to use against them. 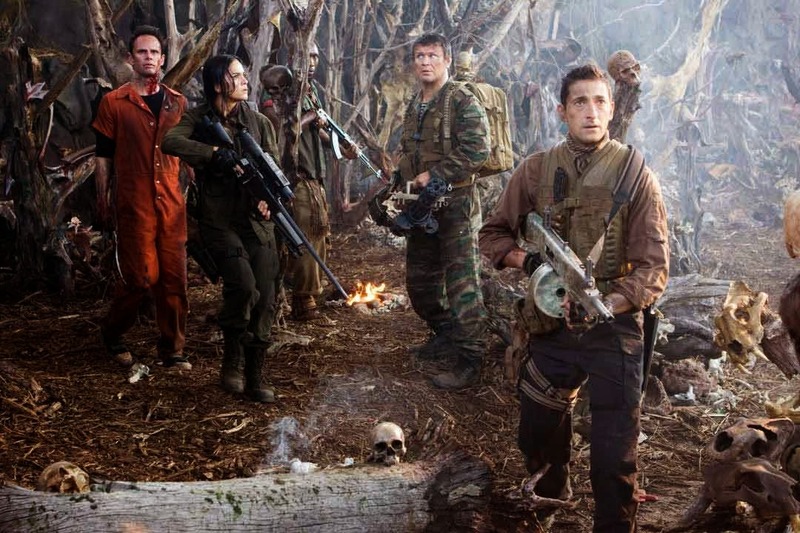 As a whole, Predator sort of tricks the audience with its appearance too -- as a macho war movie -- and then treads deeper to examine our conceits about the military, and military might. Dutch, by contrast, demonstrates qualities that our culture doesn’t always value, especially in terms of our military men. He shows compassion and decency with Anna, a prisoner. He trusts her when the situation changes instead of continuing to treat her like a foe. 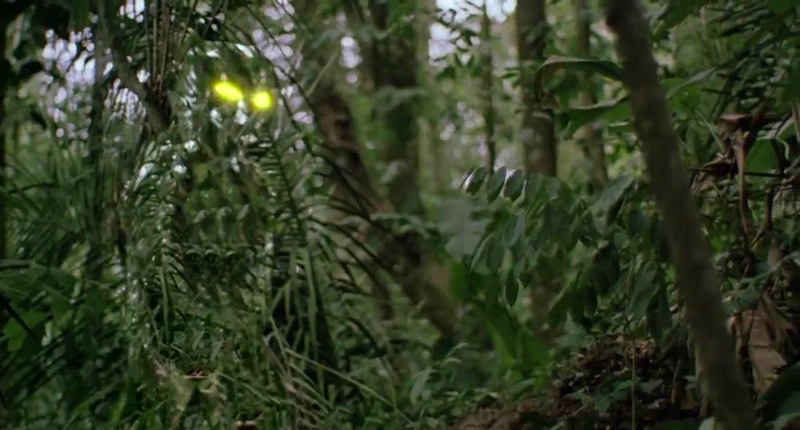 Predator still dazzles, in part because of McTiernan’s often-moving camera and approach to visuals, but also because of that incredible final sequence in the jungle. 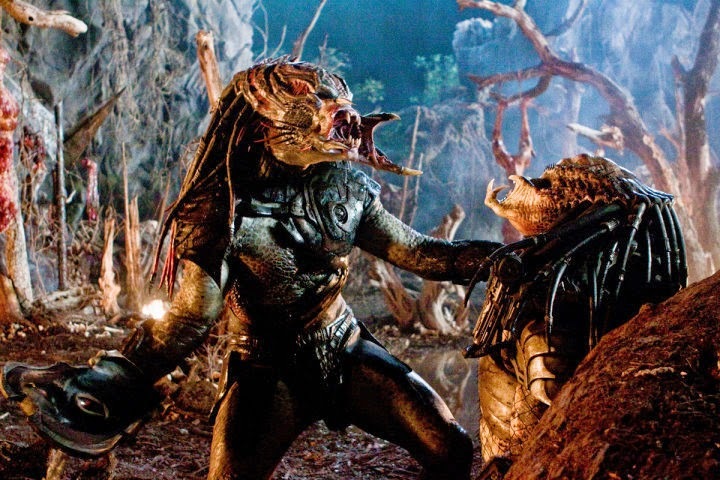 Today, we have military drones, smart-bombs, and other incredible technology to help us win when we wage war, but Predator is a remarkable reminder from another movie age that the biggest, best guns don’t necessarily make great soldiers. Korg 70,000 B.C. : "The Hill People"
In “The Hill People,” Korg (Jim Malinda) and his brother, Bok (Bill Ewing) watch the funeral rites of another tribe. A man has died while hunting, leaving behind his widowed wife, Sala (Eileen Dietz). Bok very much wants to marry Sala, but Korg suggests the time isn’t right for such a move. Bok presses his case, and they learn that Sala is promised to the brother of her dead husband. Unfortunately, Sala’s would be husband is mean (“he thinks only of himself”) and Sala runs off into the forest. Bok tracks her and finds her, and explains his feelings for her. 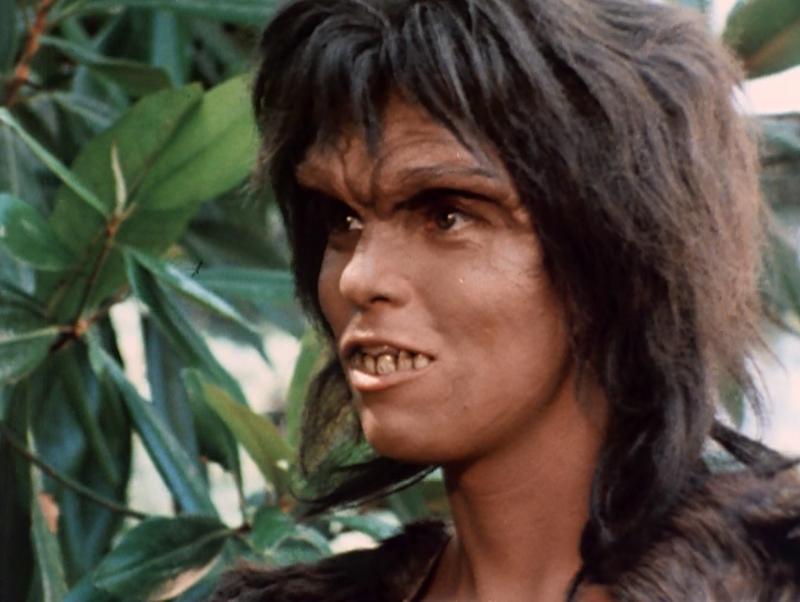 Bok brings her back to the Korg tribe, planning to marry her. “You will not be alone again," he promises. “The Hill People” is actually the finest episode of Korg 70,000 B.C. that I’ve watched so far. This happens to be so because the segment doesn’t concern an outside threat, necessarily, but a personal dilemma and social dilemma. Bok and Sala are in love, but because of the mores of the time, cannot be together. Worse, every moment they are together, they endanger both of their tribes. In the end, Sala chooses to return to her tribe, but it is not a happy ending. Sala returns to a man she hates, and who is bad to her. And Bok is left without the woman he loves. 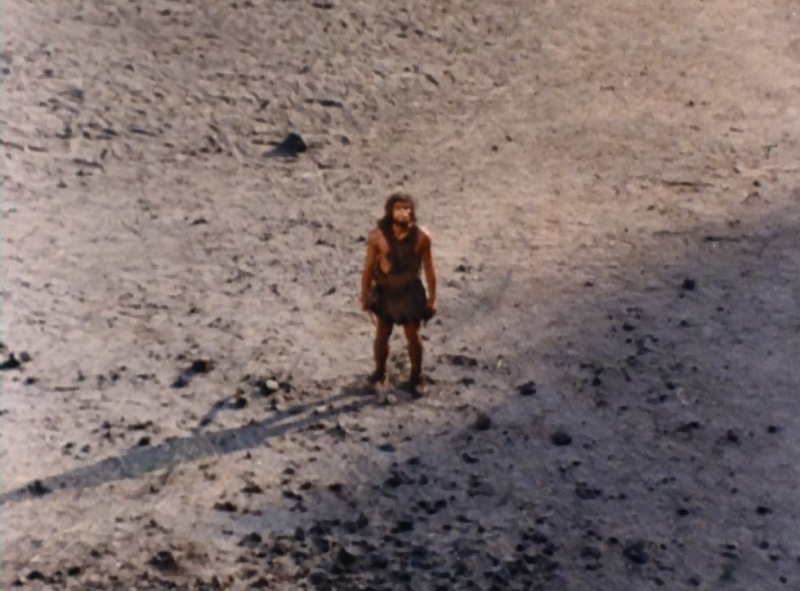 The episode ends with a dramatic pull-back of Bok standing alone on the landscape, shattered by the loss of Sala. The story succeeds not just as a love story, but as a demonstration of how a situation can spiral, suddenly, out of control. Here, both Korg and the leader of the Hill People are powerless, essentially, to stop the situation from snow-balling. By episode’s end, they have spears pointed at one another, despite alliances, despite protestations of friendship. In a way, the story aksi reminded me a little of the Helen of Troy myth, with Sala as Helen, the woman caught between two states (Troy/Korg’s tribe) and (Greece/The Hill People). Bok substitutes for Paris, and Sala's would-be husband (who demands ten spears, ten spears, ten bearskins and ten cutting tools for her…), is Menelaus. Also, the story makes a point of describing how for women -- who are viewed as property of men in the Neanderthal culture -- there is almost no freedom of choice. Sala cannot choose to spurn her brother's husband, and she cannot choose to marry whom she loves. 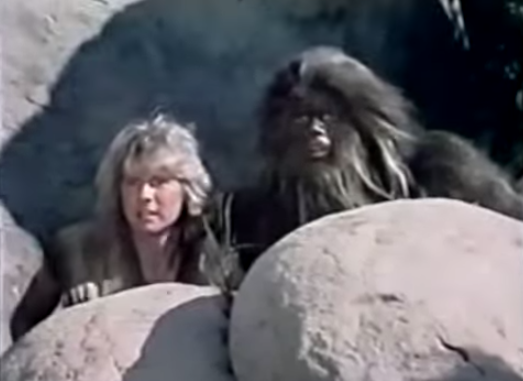 Buttressed by an unhappy ending, and the fact that the story doesn’t tie-up neatly or cleanly for everyone, “The Hill People” demonstrates how Korg 70,000 BC attempted daring and adult story-telling, even in a time-slot programmed for kids. 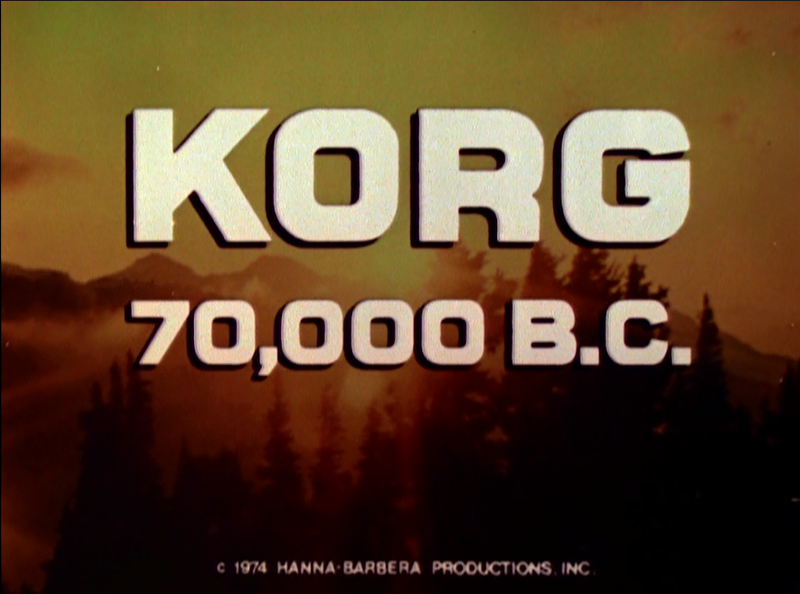 From the Archive: Korg 70,000 B.C. : "Trapped"
Lunchbox of the Week: The Man from U.N.C.L.E. Theme Song of the Week: The Man from U.N.C.L.E. Ask JKM a Question: Star Trek vs. Lost in Space?